When Rolex introduced the update GMT-C at Basel in 2005 they introduced more than just a redesigned case but also some features that is prevalent in modern Rolexes today. The Rolex GMT-C was the first to have a ceramic bezel insert, maxi hands also found on the Anniversary Submariner, Parachrom Blu hairspring, a redesigned 3186 movement, and other refinements now commonplace on Rolex watches. Back in 2005, most of the bezel inserts on the GMTs, Submariners, and SeaDwellers were made of anodized aluminum. Anodized aluminum inserts were relatively easy to make (almost too easy as these are a heavily counterfeited item) and easy to maintain, but the colored inserts namely the red-blue and the root beer colored inserts tended to fade over time. Additionally, the bezel was a simple compression fit that was easy to remove and clean, but again, too easy to counterfeit. Rolex addressed these issues by releasing the Cerachrom inserts made of ceramic. Ceramic does not fade and is durable. To address the issues of the cheesy click spring found on traditional bezels, Rolex invented a system of the bezel sliding on four spring loaded ceramic ball bearings. The bezel is held onto the watch with a zytel/plastic ring that is pressed onto the watch along with bezel insert using a tool only available to Rolex trained watchmakers. Gone are the days of being able to pop-off a bezel to clean it. Removing a ceramic bezel requires breaking the zytel ring, as well as potentially damaging the ceramic insert. Even though ceramic has high scratch resistance, it is brittle and cannot be twisted. Furthermore, reinstalling the bezel requires special tools and access to a replacement zytel ring. 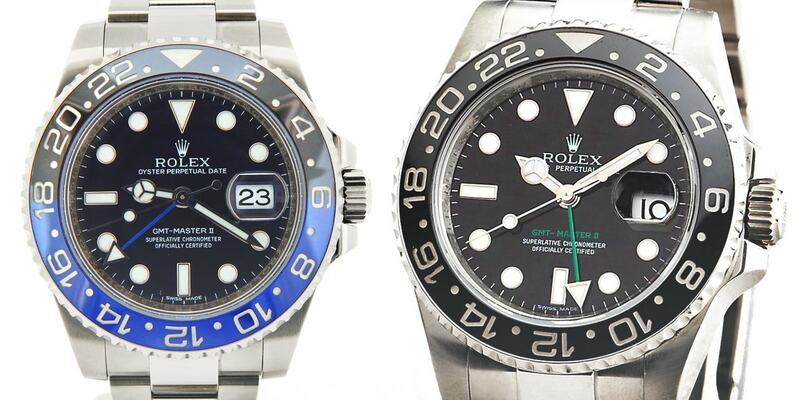 Despite these issues, the Cerachrom bezel is reliable, does not become gummed up like the old rotating bezels, and does not wear with use and one of the reasons why all Rolex sport watches utilize ceramic inserts. Did Parachrom Blu start out Blue? Another feature released in 2005 was the Parachrom Blu hairspring. Until 2000, Rolex relied upon other companies to produce hairsprings. Rather than being dependent upon outsourcing hairsprings, Rolex developed their own utilizing niobium, zirconium and oxygen alloy. Rolex quietly released in 2000 the Parachrom hairsprings in the new Daytona. No one noticed the new hairspring because it was the same silver color as before, but later in 2005 Rolex formally announced Parachrom Blu along with coloring the hairspring blue. Rolex claims that Parachrom is 10 times less susceptible to shocks, is less vulnerable to temperature swings, and unaffected by magnetism. More features introduced with the GMT-C.
3185: one complete crown revolution makes the hour hand jumps 6 timezones/hours. 3186: one complete crown revolution equals 8-9 timezones/hours. Lastly, now commonplace on all modern Rolex watches first introduced with the GMT-C is there is anti-reflective coating under the date Cyclops. One of Rolex criticism is the lack of anti-reflective coating on its crystals. Rolex made the date Cyclops easier to read with anit-reflective coating found on the underside of the crystal. Although anti-reflective coatings to make reading the watch easier, the coatings are known to scratch off with use, and the reason why Rolex only applied the coating to the underside of the watch Cyclops.